Social cognition is a captivating issue, one embedded in the cultural tapestry, fabric if you will, of our evolving society. The following is a brief outline of my groundbreaking work. In short, I have figured it out. What you ask? That is precisely the question. When we pull on the outer threads of this tapestry, we may well tempt the fates that weave the stories. Thus the central tenant of my thesis is to name the unnamed. Unmask the phantom, the eight hundred pound gorilla that has kept us from peering into the place of man. Before it is possible to name this “beast” it is essential to uncover the nature of a peculiar effect, or more correctly affect. As Shrodenginger demonstrated in his simplistic calculations, the is of identity is no longer sufficient cause to categorize the ought of the social organism. In one swift movement of a pen he forever shattered our Kantian illusions of social semblance. Allow me to digress into explaining the nature of this affect. I assure you that while it is rather complex it is not beyond the comprehension of your average intellectual. Please, as I describe the latticework of interconnections involved in this thesis, follow along on the concept map on the following page. As many recent sociologists have noted the study of society begins in the study of cultural forms, I call them cultural products But as I have noted previously, and has been widely accepted, the semiotics of cultural products is squarely based in four functions, The intertextual, the hypertextual, the transtextual and the supertextual. All of these relationships follow the structualist impulse, namely tying pieces of substance, of essence, to cognitive activities. As an aside, it is fascinating that the harmony of the four Aristotelian causes is reiterated here. With this established it is quite plausible, if not absolutely necessary to see how these signs and signifiers project on to the signified, namely the conception of metaphor. Metaphor, as I see it, is the thread, which hems the pants of our society. With out it our cuffs would drag on the ground and look none too civil. Now I understand this is a lot to take in. It is probably worth rereading the previous paragraphs several times before we continue. However, we have yet to arrive at our desired Affect, namely the Liminality Affect. So I must press on. Moving to the bottom right of the diagram you will see what I refer to as the tie fighter effect, named thus because of its appearance, looking much like a tiefighter. Yet the name has a deeper significance. For the Social Construct is in effect the lace, which crochets its four constituent parts together. As you can see Race, Place, Space, and Interface interact in mutual connectivity with the social construct in effect becoming the social construct. As you can now see, quite clearly, these are the particles that make up the chemicals, which make up the elements of our society. It is as a polymer, of earth fire wind and water that we have communed with the ultimate liminality of our universe. How fascinating that this alchemical explanation, which failed in the natural sciences should ultimately be the saving grace here in the social sciences. Now that we have covered that it is possible to move on to the task at hand, to demonstrate the proof of the existence of a ‘figure’, in effect the affect becomes the slide rule which allows for the justification to enter in to the high temple. Where, we can now tear the curtain in two and recognize our place with in the fabric of this social organism. As before it is crucial that you follow along in the diagram. For language often fails us inn these matters, and when one is attempting to map a seven dimensional theory with pen and paper it is essential that he take everything he has to do so as carefully and clearly as possible. We begin in the upper right hand corner, what is the nature of the cognitive? A question that has plagued theorists from the dawn of thought. As Edward Anthony’s work with the indigenous of Polynesia has demonstrated, as counterintuitive as it may seem, thought is diametrically opposed to the notion of culture. The two converge in a flash, at the dawn of the Paleolithic, in what can only be explained in terms of the either or of space and place. These concepts, or more clearly, precepts become the building blocks for the metaphoric tower of bable, which has become known as discourse studies. The platonic form, which constitutes our metaverse, has, in recent years, been encapsulated in a microverse, namely the Internet. As an outgrowth of the tecnoscientific culture of “emergence” which has come to the foreground in the later twentieth century we now have the tool kit to piece together the substrata of our civilization, and thus all civilization. When you consider the actions of Dinobot, who produced the machinama “Druid Revelation” it becomes obvious that the call form the forum, demands a quorum to innervate all. Meanwhile, on the other side of the world, and the other side of our chart, the Zapatistas are struggling under the weight of the failures of social control, social justice and the nature of the corporate hierarchy. All of this points to only one truth, that there is no “way of being in the world” in effect, or affect, we have disreputed the nature of discourse studies at their kirkergardian roots. It becomes so painfully obvious, when we consider the actions of dinobot in conjunction with the advent of techno in a world where the daily injustices faced and perpetrated by and on the Zapatistas that the Kirkegaradian notion of a way of being in the world has been perverted in the Nietzchian farce. We are no longer “poets of our own lives” we are ruled by the social forces which function as the hydra, fortuitously foretold in the revelation of john. Don’t confuse what I propose, I have not, come to Jesus, but instead he as come to me. I am a witness for the nature, power and glory of my own thoughts, and their stunning clarity and brilliance demand a higher being, or entity, namely, myself. Marjee and I had a great time at the HSS conference in Vancouver, (Pictures comming soon) We had great food, and I think our papers were well recived. I also interviewed with the Atomic Heritage Foundation. It went well, I was there for over two hours. Keep your fingers crossed. I think this one might just work out. The next morning, Tuesday, I reported to the downtown office where I would be working. After making my way through security I called Jesse to come down and bring me up. I got her answering machine. So I waited. Twenty minuets go by and I figure I should call her again. This time she answers and comes down to get me. She brings me up to her cube, where she tells me that Sandy will be in about an hour later, at which point we can meet and discuss my duties. So I spend the next hour waiting in her cube, as she goes about her daily activities. Luckily I have a time magazine in my bag. So I just settle down to read. After an hour and a half goes by Jesse informs me that Sandy is now in. She goes of to check with her. When Jesse returns she is looking for a form, the pdd form, it turns out there is a new form that needs to be submitted with my fingerprints and that until that is submitted I cannot be on the premises. So Jesse arranges for me to go to the **** system building a few blocks away. I will work there until things get settled for my work. Fair enough. So for whatever reason I wait in Jesse’s cube for a few more hours, I have exhausted my time magazine and find myself staring at her screen saver. You know the one with the two sets of colored lines that bounce around. It turns out that it is really easy to space out and focus on the speed of the points that make up the objects. I must say I hand never taken the time to appreciate that screen saver before and without this job that knows if I ever would have. At about 11:30 we start to walk over to the other office. It is raining, and I have no umbrella. We arrive a little bit before noon. The office manager gives me a tour of the facilities, finds me a small office with a computer that I can use temporarily. It is a nice place, with a full kitchen. So Jesse informs me that I will be working here until my paperwork clears. I ask her what I will be doing? To which she responds she is going out on vacation for the next week, but my manager should be back from vacation the next day. So I sit down to my computer, I figure I can go through the mandatory training, schedule my drug test set up my company email. Start to settle in. Strangely, this is not an option. I attempt to log in to no avail. I called the company’s help line to find that I need to tell my manager to activate it. Soo I ask the office manager, she goes through some forms and such, submits the information and tells me that in the next day or so I should have internet access. Great. One problem, I can’t even get on to this computer to type in word. I tell her that I will head home for the day, and see her tomorrow, when hopefully I will meet my manager and start to do something. I head home with the intention of working on my online training, low and behold the password and login don’t work. So even If I had had computer access I would not have been able to do much of anything. So this is my second day of work. It is getting close to noon, on day two. I came in at 8:30 and thus far have managed to compose the entire history of what has brought me here. I have yet to meet my manager, whom I am told comes in very early and then goes somewhere, and comes back at some time during the day. I still do not have access to the computer and am very glad that I brought my personal laptop. Scratch that. It is 11:37 and I have received a log in and password. Lets see if they work. Around one thirty today I got to meet my manager, lets call him Jeff. I think I like Jeff. He was very nice to me. Told me that he had been in touch with Sandy and that she would have some work for me on Friday. He seems like a bit of an early riser, wants me here at 7:30 Friday. Until then, today and tomorrow, I am supposed to study up on the government bureaus I will be working for online. I do like to surf the net. After the rather Herculean task of getting to my orientation the event itself was rather pleasant. The acting president of the company welcomed the 11 or so new hires, we heard about our benefits, and company procedures. Watched some low budget films about ethics, they gave me a name badge. All fun stuff. At lunch I met some of the folks in my division. Seem like neat people. All in all a good time. The trip back home was not that eventful, Things really seemed to be coming together. I talked to my mother today and she told me that our family dog, Scout, went up north for her last time. Scout is nearly 12 years old, a respectable age for a dog. Lately, she has been having a nearly impossible time walking and getting up the stairs. This happened earlier this month and my mom and dad took her to the vet, where she got some medication. The medicine helped her walk a bit for a few weeks, but she soon became very weak again and could not get around and lost her appetite. So, this weekend, my father took her up to our cabin. My aunt, who lives up there, will take Scout to be put to sleep and Scout will be buried there. I could not find a digital photo of Scout, so instead I am posting a picture we took last October up near our cabin, where Scout will be buried. 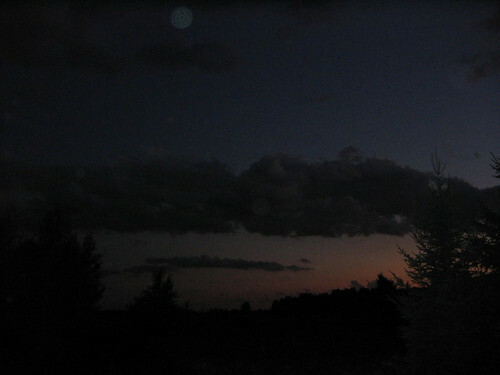 It is a picture of the sky at dusk. Here are some things you should know about Scout: She loves Polish sausage, she likes to shake hands with you multiple times. She loved road trips. When she was younger, she enjoyed biting people in the ankles in an attempt to herd them. She enjoyed chomping her teeth into my brothers socks and almost ripping them off. This is, of course, very sad. I can’t believe I won’t see Scout again and I am so glad I saw her earlier this month when we went to Chicago. But Scout led the dream dog life. She ate like a queen, she had lots of people around that loved her. She took frequent vacations in the Northern woods. She was bilingual, she was smart. I’ll never shake a paw like hers again. Thank you Scout for all of your puppy sweetness. I don’t think there is a better dog out there. Rest in peace, may your spirit chase chipmunks through the pine trees until Babcia calls you back in the house. For those of you who don’t know the DC area that well, the International airport is in no way convienently located near the city. It is an hour by car, and as I found out, two and a half hours away by public transportation. I rolled out of bed at 4:45 in the morning. Which was quite a feat in it’s own right, and made my way to the metro station. I took the metro to a buss depot, where I rode a freeway flyer to a second buss depot. Once there I snagged the local buss for a twilight tour of urban sprawl. I looked through the rack of bus route maps on the bus, sadly the only one that was empathy was the route I was on. So I asked my bus driver if she could tell me when we reached the stop that the transit authority’s website had directed me too. Which is not the look you want from the person in charge of getting you where you need to be. She said she had never heard of the stop before. At this point I felt relived. It seemed that the critical piece of information had been transferred. But as we rode around the route I couldn’t help but feel uncomfortable. As we passed stop after stop and rapidly approached the time that my iteniray told me I should be getting off the bus I asked her. Tragically she seemed to again be perplexed. I don’t think I fully communicated the situation and she said it might be around this stop. But we continued to another stop…. Convinced that I had just missed the stop I asked to get off as soon as possible so I could head back. She let me off, and I began to wander around in the twilight looking for an address that effectively made no sense in relation to all the addresses I saw around. It was one of those great places where there are no sidewalks, as I walked back along the route the bus had come in I again wondered “How on earth am I going to find this place. It all looked so close on the map, but now it just didn’t make any sense. Passing a hotel I decide I would try to get some directions. I entered the comfort inn with a cadre of what seemed to be Middle Eastern businessmen. When I asked the man at the front desk if he could give me directions or a map, he said he didn’t really know the area, but that a man in blue by the buffet knew it quite well. I expected that he was referencing another employee. Walking into the next room, which housed the buffet, I found a man in a blue jacket, clearly not an employee but still the only person in blue. I walked back to the desk to confirm that I was in fact to talk to the man in the blue jacket. He had a kind of trucker look to him. I was told ‘yes’ that was he. As I asked the man in the blue jacket if he could tell me how to get to the office he gave me a “who the hell are you” Kind of look. Much better than a perplexed look I pressed forward. He told me to ask the man in the blue shirt who was upstairs. Why not, I still have half an hour to get to the office. Considering, What choice do I have but to hop in this mans car in hopes of getting to my orientation? I head back downstairs to find the trucker looking gentleman, the one in the blue coat. He tells me that I could use the computer in the business center to find my way. Overjoyed at the prospect of looking at a map, and finding the hard facts I plugged in the address I needed to get to and the address of the hotel, I printed the directions and decided to head out on my own to find the building. I printed them out and started out the front door. As I headed out I started to remember my high school gym classes, particularly how long it took to go a mile. In tiptop shape I could run a mile in six minuets and some change. My directions called for me to travel some two and a half miles, in thirty minuets. I realized in the parking lot of that comfort inn that there was no way I was going to be even close to on time if I walked it. So I figured, why not take my chances with the Middle Eastern man’s car. I found him, this time near the buffet; I showed him the map I had printed off, which he quickly dismissed as wrong. He said he knew where it was and that that was not it. Remember he had been somewhat perplexed by the address before, but for whatever reason looking at the map gave him all sorts of confidence that he knew and that the Internet was wrong. What the hell, what else do I have. I snacked on a muffin while he gathered his things and we hoped in one of those big hotel van things and went on our way. Strangely we headed back the exact way I had walked from the bus, we passed the stop that my driver had several hours earlier left me off at, the one after the one we thought it was, or at least I thought it was. Apparently my bus driver had not been as perplexed as I had thought she was. As I drove past the bus stop I had been left off at, and headed about 600 feet to my final destination my mind wandered through events that brought me here, It felt like a full day, and I hadn’t even begun my 8 hr orientation. I had a day to fill out the paper work and believe me it took the better part of that day. Once the paper work was finished I needed to head back down to the down town office to be finger printed. Keep in mind that I have not been offered a job at this point. Instead I am doing this on my own time, really for my own enjoyment. So I head down to the office at the appointed time, go thought the rigmarole with the metal detector, and minor interrogation from the guards. This time I know whom I am seeing, so I assume smoother sailing. But then I should have remembered, this is the government, why on earthy would anything ever smothe out. Jesse did not answer her phone. In fact she did not answer her phone for the next hour as I sat down on the bench and listened in on the security guards complaints about their union. After about two hours I gave up. Headed home, and counted it all for a loss. I emailed Jesse, she told me She was sorry, but she was running late. So we confirmed that we would try it again tomorrow. The next day, after all the security whatnot, Jesse came down and we headed over to a different building, where I was finger printed. I turned in all of my paper work and went back home for the day. A few days latter I received a frantic request from Jesse for me to sign and fax a predated ‘PDD’ form. It descried my duties and informed me of my title of “acquisition associate”. Still I have not been confirmed for the job. I haven’t heard from Ryan for a few days. Later that day he called me, and told me that an offer letter would reach me by the end of the day. It came at 6 at night, and offered me another stack of papers to fill out. I was also informed that I would need to be at orientation on Monday, at a different office out near the international airport. Early the next week I found myself again on the phone with Ryan. Briefly he told me that I would be interviewing downtown at one of the government buildings, He said I would meet with a woman named Jesse, a ***** System employee who would prep me for the interview with someone else. While I was still trying to piece together what exactly was going on I decide to get my interview gear together. First I gathered my newly bought interview suit, I took my laptop messenger bag to carry some paperwork in. The next day I rode the metro downtown, and went to the building, where I was to a minor degree interrogated by the security folks, after they saw my drivers License, and I gave them my social security number I walked through the metal detector, they asked me who I was here to see. I reached in my pocket for the information I had printed out. I had directions to the location, Directions to the second location, where I would discuss benefits with Ryan, but for whatever reason I did not have Jesses last name or phone number. I was even fumbling to remember her name. Was it Jesse, or Jerry, or Sherry? I had no Idea. In my attempt to grasp at last straws I called Marjee. “Could you look up my email and find the name of the woman I am supposed to meet down here?” I franticly asked. Marjee, who is by now as accustom as one can become to my frantic ‘I lost everything- please make it better’ calls said she would look it up in five minuets when she got to work. As some of the slowest ten minuets of my life pass before my eyes I think ‘what am I doing here’ several times. As my phone rings, the ring tone associated with marjee’s phone, the thought passes and after poorly directing marjee around my cluttered email box I have her name, which will be able to get me her number from security. The guards now give me her number, and as I triumphantly call, no more than two minuets late…. I get her answering machine. I leave her a message; tell her I am in the lobby. And return to the bench in the lobby, waiting. After about half an hour, I ask one of the guards for her number again, to leave a second message. As I tell him her name he says. “Oh, She is right there” A woman had just come around the corner and announced “Oh, Hi you must be Trevor. Come with me, these guys know me this is all ok.” I followed her outside. After introducing herself to me she told me I would be meeting with Sandy, who would interview me. Sandy apparently is in charge of the division I will work for. She is not a ***** System’s employee, she works for the government. Jesse apologizes for being late; she has apparently just gotten there. She informs me that Sandy is also running late, and will not be there for half an hour. So we wait for her to come in. Eventually Sandy shows up, and we get to the interview. I regale them with my finely crafted “I got a bad grade on a paper and then I got a good one” story, and a few other yarns and they seem to like me. The interview wraps up and Sandy has to get back to work. Jesse tells me that I will most likely have an offer very soon, and thanks me for coming down. As I left the office and walked over to the **** systems office I found myself wondering at how bizarre and convoluted it all seemed. I thought ‘well that other job is probably about to come through, so this is just a back up, I can handle that.” But alas I never heard from the other job and after a compelling discussion of their benefits package I started to think this could be a good deal after all. I had worked my job search life into a regular pattern. I would wake up around 9 and often work out. Watch some cartoons while I surfed the net for job openings, check my world of warcraft auctions and then dive back into scouring the Internet for jobs. Part of every day was spent reading some of the books I had picked up on job searching and resume writing. After working out one day, toward the end of my shower I heard my cell phone ringing. While my job books all told me not to answer calls, to let my voicemail get it and return the call later, I was waiting to hear about a job interview at PBS and thus wanted to know. I jumped out of the shower, grabbed a towel and proceeded to be interviewed for a position for a company I had never heard of. The call went something like this. Searching for a way to say no with out saying no I responded. “We are a government defense contractor, working in a variety of capacities for different governmental projects. We have a position opening and I wanted to see what you are interested in, Could you tell me briefly what kind of work you are looking for”? With that, the conversation was over. There I was, still wet wearing a towel in our bedroom, wondering at how absurd it would be if I started to work for a major military contractor. I really did not think anything would come of it. I figured it was the last I would hear of Ryan. But it turned out I was quite wrong.